Golden Bay Air had its origins in a company called Zephair Limited which was founded by Richard Molloy and Lisa Sheppard in November 2005. 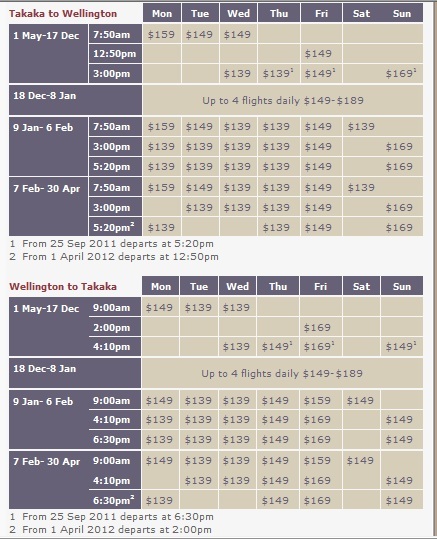 Flights begab between Wellington and Takaka beginning on the 12th of January 2006 under the name of Capital Air. A change to the company name was made in September 2006 when Zephair Ltd was renamed Capital Air Bookings Ltd. The company mainly used Piper PA-32R-301 Saratoga, ZK-ZIG on the service (c/n 32R 8013045) but Beech 58 Baron ZK-WLV (c/n TH 698) was also used. The aircraft were based in Wellington and crewed by instructors from the Wellington Aero Club. Initially flights operated twice a week, on Fridays and Sundays, with additional flights over long weekends. In 2006 these flights ran until Queens Birthday weekend and then ceased over the winter months restarting in late September. In following years the flights ran from late September until late April with the frequency of flights increasing, especially during peak summer periods. During the peak season up to six flights were scheduled per week with additional flights operated on demand. Same plane - different titles! Above, Piper Saratoga ZK-ZIG with Capital Air titles at Wellington on 16 April 2009 and below, with Golden Bay Air titles as it gets airborne from Wellington for Takaka on 4 February 2010. In May 2009 Capital’s Air base was moved from Wellington to Takaka and the company was renamed Golden Bay Air Ltd to reflect its increasing commitment to the Bay. In making the move to Takaka the company also sought improvements to the Takaka airfield. These works included maintaining the cross runway and the provision of a GNSS instrument approach. The company also advocated the cross runway being sealed and a loop taxiway being established. Co-owner Lisa Sheppard told the Golden Bay Weekly that this could enable the introduction of “a bigger aircraft – maybe a 10-seater.” said Ms Sheppard. With the move to Takaka Golden Bay Air increased the number of flights to Wellington by 20%, added a scheduled service to Karamea for trampers on the Heaphy Track and, in October 2009, and added Piper Pa28-161 Warrior II (c/n 28 8016367) to the fleet. The company also introduced a shuttle service to Wainui in Abel Tasman National Park and Browns Hut at the start of the Heaphy Track to connect with their services. Piper Warrior, ZK-EQS, at Takaka on 14 February 2010. 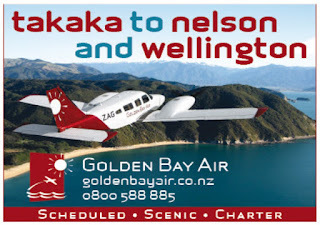 From the 22nd of September 2010 Golden Bay Air introduced a year-round Takaka-Wellington service. At that time the timetable indicated that from the 22nd of September to the 18th of December the company would operate a single flight six days a week. Over the summer break until the end of January two to four daily flights were scheduled, depending on demand, and then from the 31st of January till the 30th of April the company planned to operate two return flights from Sunday through to Thursday, three flights on a Friday and a single flight on a Saturday. Over the winter months the company planned a Monday, Wednesday, Friday and Sunday flight offered. 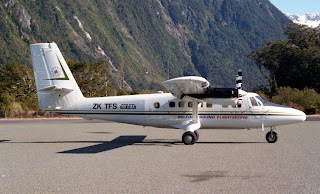 The company is also offered a daily scheduled flight between Takaka and Karamea from the 22nd of September 2010 to the 30th of April 2011 with winter flights being on demand. 2010 saw a new GNSS instrument approach being commissioned at Takaka with new RNAV routes to Takaka implemented. The company also built a new hangar and rebranded the Saratoga in the company's new colour scheme maroon colour scheme. The company also moved its Wellington arrival and departure point from the Wellington Aero Club, first to Capital Jet Services and later to the main terminal building increasing the public profile of the air service. Following an incident with the Warrior ZK-EQS in early 2011, the company imported a more powerful Piper Pa28-181 Archer II, ZK-ZOG (c/n 28 8690010) which was delivered to Takaka in April 2011. This is mainly used for to Karamea and for local flying, however, it has been noted flying the Wellington service when loads are light. Piper Pa28-181 Archer ZK-ZOG enjoying the Golden Bay's golden sunshine in June 2011. The company had, for some time, being wanted to introduce a more reliable air service capable of operating in all weathers. With the installation of the new instrument approach Golden Bay Air introduced Piper Pa34-220T Seneca III, ZK-ZAG (c/n 34-8333002) to its fleet in June 2011. The Seneca and the Saratoga will both be primarily used on the Wellington service. Looking very sharp is Golden Bay Air's Piper Seneca ZK-ZAG awaiting take-off clearance at Wellington on 27 October 2014. 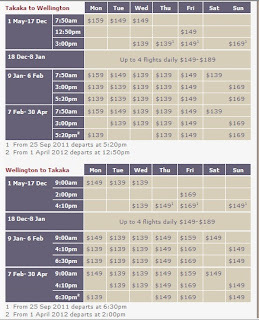 By winter 2011 the company had reviewed its winter timetable and introduced a Takaka-Wellington return Sunday to Friday with a second flight on Wednesdays and Fridays. Golden Bay also began operating flight for pre-booked passengers from Karamea to Takaka, Motueka or Nelson, timed to suit. Flights are operated between the centres if there were at least two passengers wanting to fly. 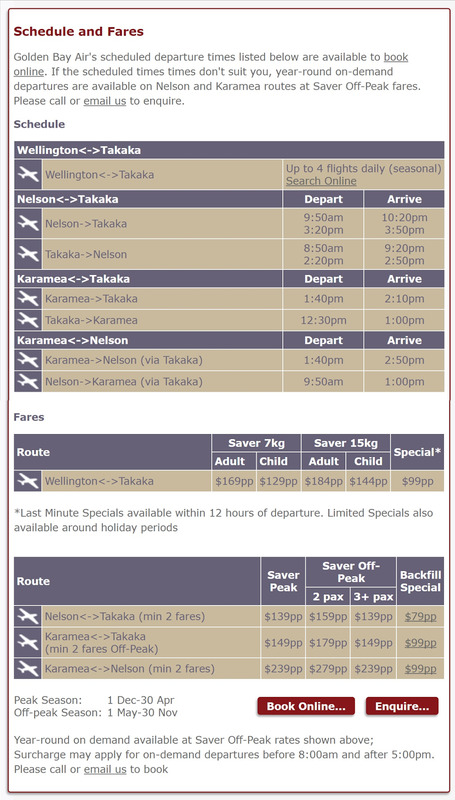 The flights between Karamea and Takaka were listed as a shuttle service and these later were listed as scheduled flights. 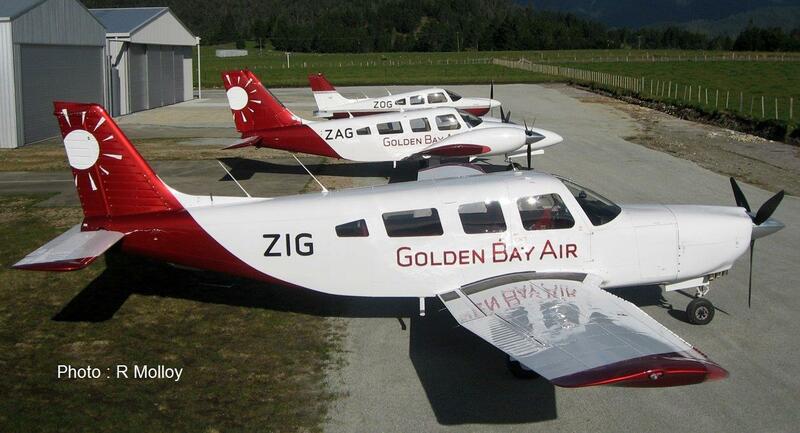 The Golden Bay sun shining on the Golden Bay Air fleet - Saratoga ZK-ZIG, Seneca ZK-ZAG and Archer ZK-ZOG at Takaka in June 2011. In April 2012 Golden Bay Air built a small terminal at the Takaka airfield. 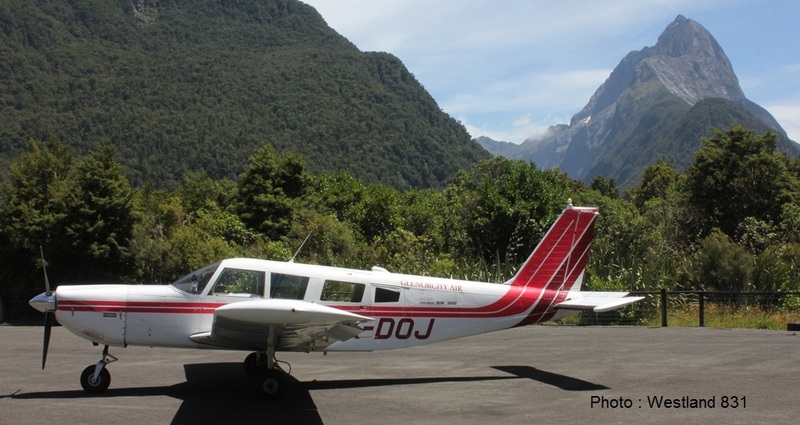 The 2016/17 summer season saw the company adding scheduled flights from both Takaka and Karamea to Nelson in support of people tramping the Heaphy and Abel Tasman tracks. 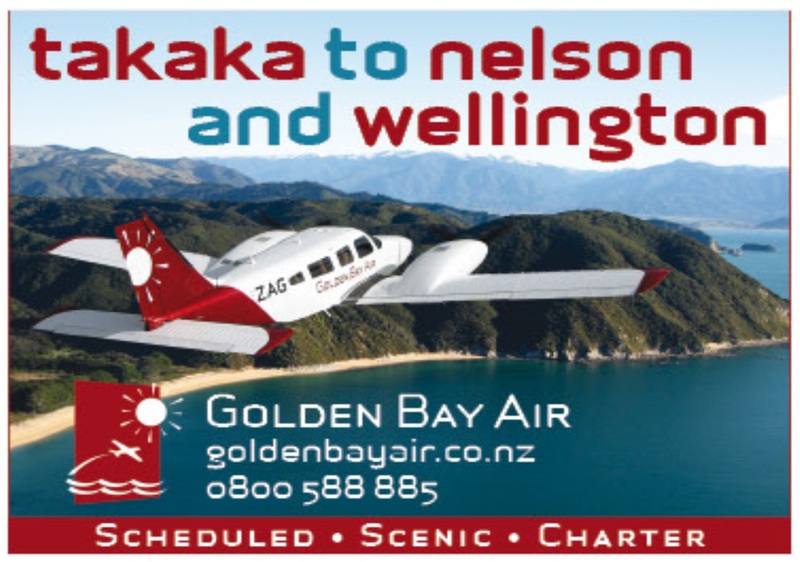 Golden Bay Air continues to operate year round flights from Takaka to Wellington with up to four flights a day being flown at peak times and a daily flight during the winter. The company also operates daily on demand flights from Takaka to Nelson. Flights from Takaka to Karamea operate on demand. There are numerous flights particularly over the summer season and mountain bike season on the Heaphy track. 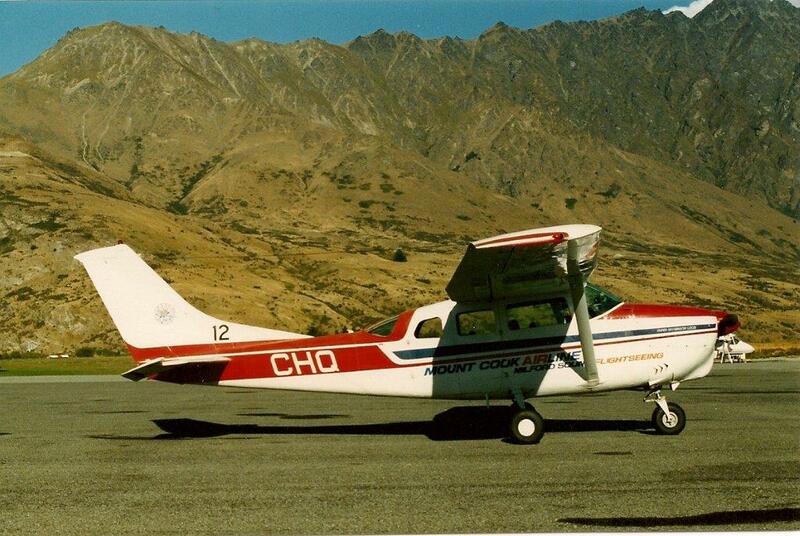 Glenorchy Air Services & Tourist Company Limited was established as a family business by Janet and Robert Rutherford on the 29th of September 1992. Named after the historic township of Glenorchy at the head of Lake Wakatipu the company began operations from Glenorchy with Cessna 185C Skywagon, ZK- CHK (c/n 185-0755). 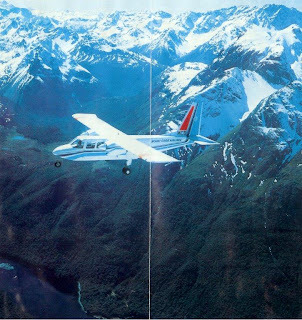 Trading as Glenorchy Air the company later expanded operations to Queenstown and began operating regular on demand tourist flights to Milford Sound. 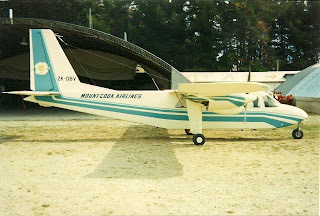 As the business grew a second aircraft was needed and Piper Pa32- 300 Cherokee Six, ZK-DOJ (c/n 32S-40638), was purchased in 1996. In 1999 Glenorchy Air was used extensively to transport members of the cast, crew and equipment for the Lord of the Rings film trilogy around the southern half of the South Island of New Zealand. This included flying producer Barrie Osbourne on reconnaissance trips to Paradise, Poolburn and Ben Ohau. Glenorchy Air's Piper Pa32 Cherokee 6 ZK-DOJ at Milford Sound on 10 January 2014. The Cessna 185, ZK-CHK, was sold in 2003 and was replaced by a Gippsland Aeronautics GA8 Airvan ZK-LOR (c/n GA8-03-034). The Airvan was so registered ZK-LOR to reflect the company’s involvement during the making of the Lord of the Rings trilogy and the fact the company continue to provide air tours to some of the locations used in the filming of Lord of the Rings. 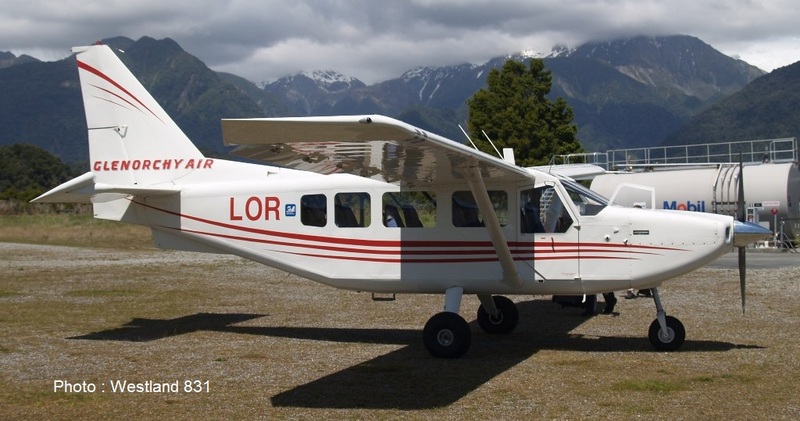 Given the company's connection to the Lord of the Rings as reflected in the Gippsland Airvan's registration, ZK-LOR, one wonders whether the company name should be rewritten as GlenORChy Air. The Airvan on a trip to the Glaciers, seen here at Franz Josef on 26th of November 2007. The company website says Glenorchy Air provides scenic flights from Queenstown and Glenorchy to many destinations around the South Island including Milford Sound, Mount Cook, the Glaciers, the penguin and albatross colonies of Otago's east coast and to New Line Cinemas, Lord of the Rings movies location sites in the southern part of the south Island of New Zealand. 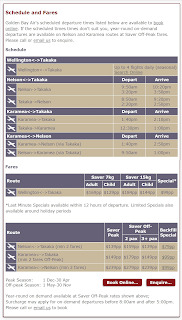 During the 2010/11 summer season the website also showed a Queenstown and Wanaka shuttle air service being offered on demand. In 2013 the company offered a scenic airlink to Treble Cone skifield meaning skiers and snowboarders could be on the mountain in only 20 minutes from Queenstown Airport. A second Airvan, ZK-JRR, was added to the fleet in 2013. On the 5th of Augsut 2014 the Piper Cherokee 6 ZK-DOJ was involved in accident near Poolburn killing the pilot and injuring two American tourists. The aircraft was written off and was replaced in 2015 by a third Airvan ZK-ZEA. This post is purely to provide links to posts of operators that have operated services to Milford Sound. It will be updated as an when new posts are done or as and when posts are revised. If I have left out any operators please email me or write a comment. A regular scenic route between Queenstown and Milford Sound was first established by Southern Scenic Air Services. Ltd. 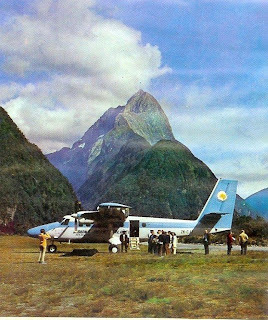 In August 1951 Southern Scenic landed an Auster on a beach at Milford Sound. This was the prelude to the establishment of an airstrip at Milford which enabled regular flights from Queenstown with Austers, Proctors and later Cessnas. In 1956 the airstrip was upgraded to handle Dominies, with the Milford flights becoming the heart of the company’s tourist flying. In May 1965 Southern Scenic Air Services Limited merged with NZ Tourist Air Travel Limited and on the 1st of January 1968, Tourist Air Travel was subsequently bought out by the Mount Cook and Southern Lakes Tourist Company which became more commonly known as Mount Cook Airlines. 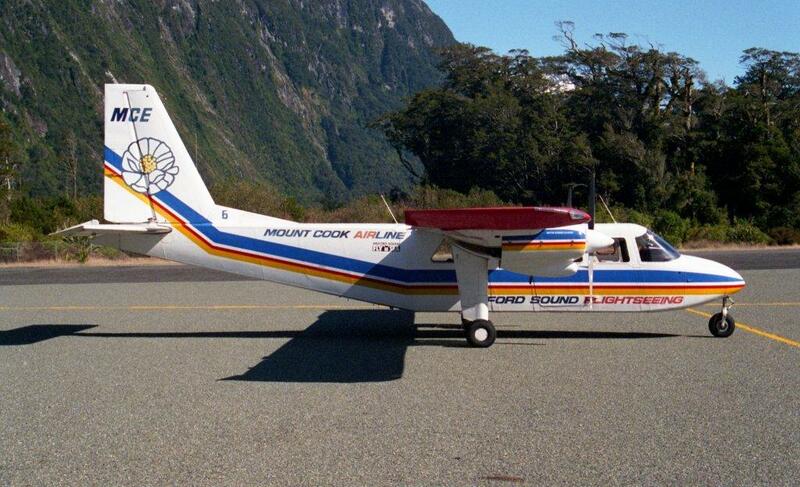 For the next 30 years Mount Cook Airlines operated scenic flights to Milford Sound from both Queenstown and Te Anau. Initially the fleet used comprised of a De Havilland DH89A Dragon Rapide (ZK-AHS), De Havilland DH89B Dominies (ZK-AKY, ZK-ALB and ZK-BCP) some Cessna 185s and a Cessna 206 (ZK-CHQ) which were inherited from Tourist Air Travel. 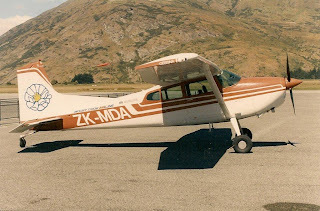 Two aircraft inherited from NZ Tourist Air Travel... above, De Havilland 89 Dominie ZK-ALB and below Cessna 185 Skywagon ZK-CHL. Both photos taken at Queenstown by D White. By the early 1970s the Dragon Rapide and Dominies were retired in favour of more modern light twin engine aircraft. Mainstay of the Milford route was the Britten Norman Islander which began service in September 1970. They were used extensively on the flights to Milford Sound as well as on the Queenstown-Te Anau and Queenstown-Alexandra-Dunedin routes. 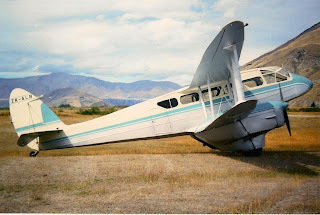 In the North Island they were also used on flights north from Auckland to the Bay of Islands and, for a time, to Great Barrier Island, and south to Rotorua. 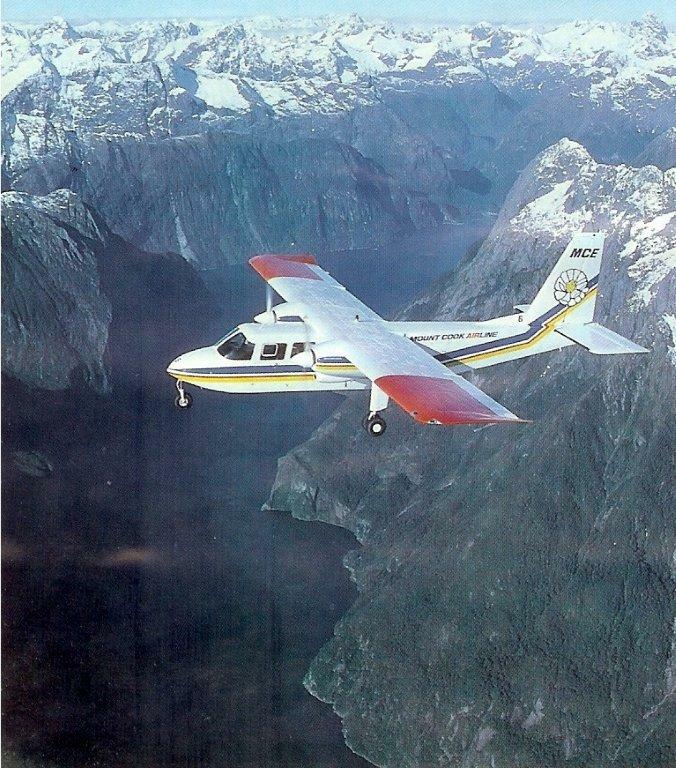 In addition to these "land" operations trials were made during 1974-5 with an Islander equipped with retractable skis. 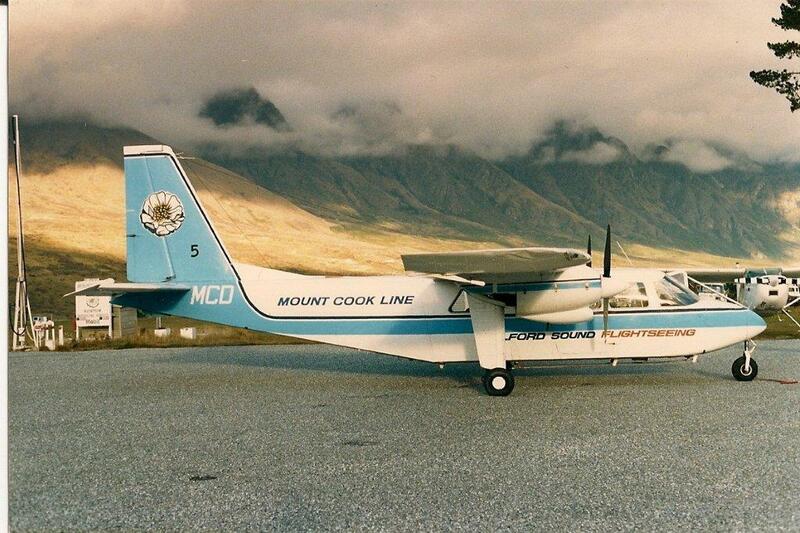 Over the years Mount Cook Airlines operated six Islanders; ZK-DBV, ZK-DBW, ZK-MCB, ZK-MCC, ZK-MCD and ZK-MCE. The first two BN Islanders. Above, ZK-DBV at Queenstown in the original colour scheme, Photo : D White, and (below) ZK-DBW whilst on a Queenstown-Manapouri-Queenstown service. Photo taken at Manapouri on 17 May 1978 by I Coates. On the 2nd of December 1969 Mount Cook Airlines introduced a De Havilland Canada DHC-6 Twin Otter, ZK-CJZ to its fleet. 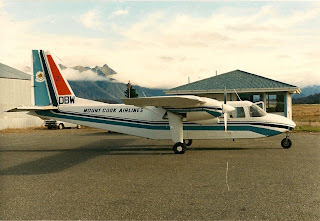 This 18 seat turboprop was also on the Milford Sound, Te Anau and Alexandra-Dunedin routes but it proved to be uneconomical and was sold in September 1973. A postcard of the Twin Otter at Milford Sound with the unmistakable Mitre Peak in the distance. 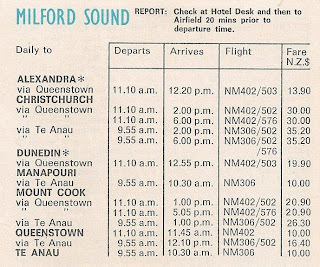 Even before Mount Cook Airlines took over Tourist Air Travel the air service featured in Mount Cook's timetable. Early timetables show Ritchie Air Services and Southern Scenic flight numbers. 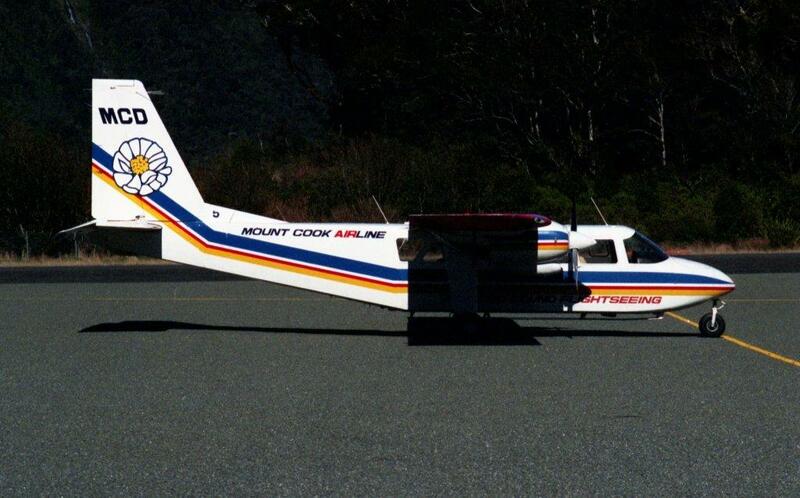 When Mount Cook Airlines took over their own flight numbers appeared. 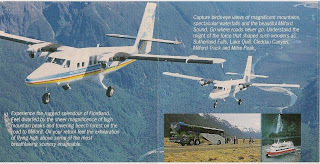 In addition to the scheduled flights to and from Milford Sound extensive additional flights were operated as and when required for the heavy tourist demand. 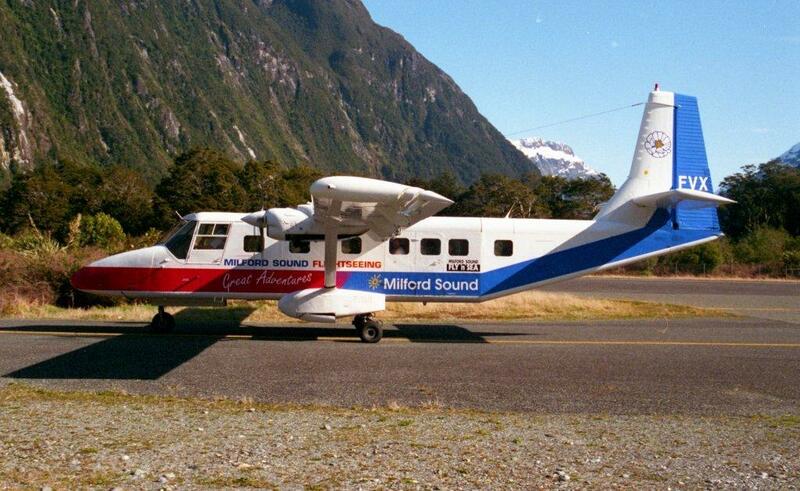 Apart from Milford Sounds Scenic Flights no other recent operator has published a scheduled timetable for their Milford services. 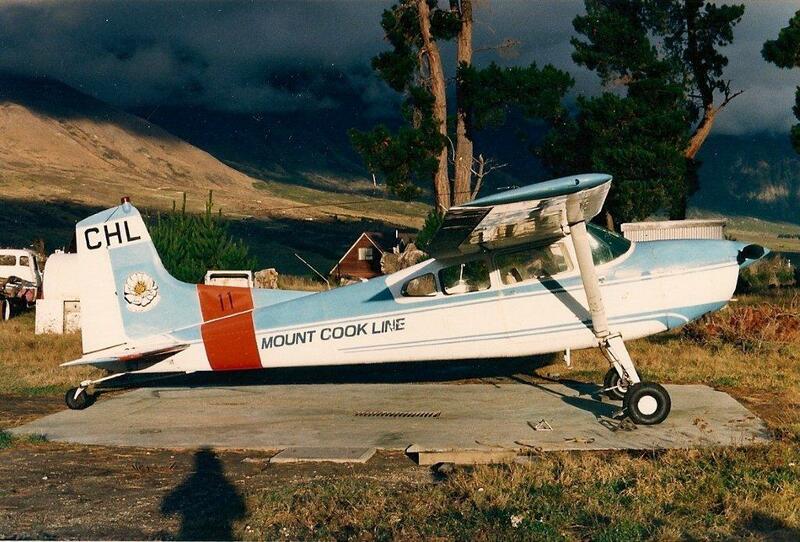 Through the years there was some rebranding of Mount Cook's aircraft flying into Milford. 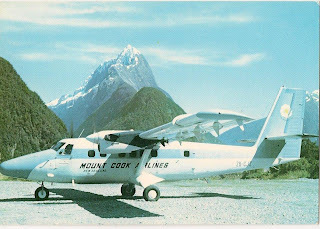 From 1980, reflecting the company's diverse interests, including the airline, tourist and scheduled bus operations, freight services and skifields, the company became changed its branding from Mount Cook Airlines to Mount Cook Line. 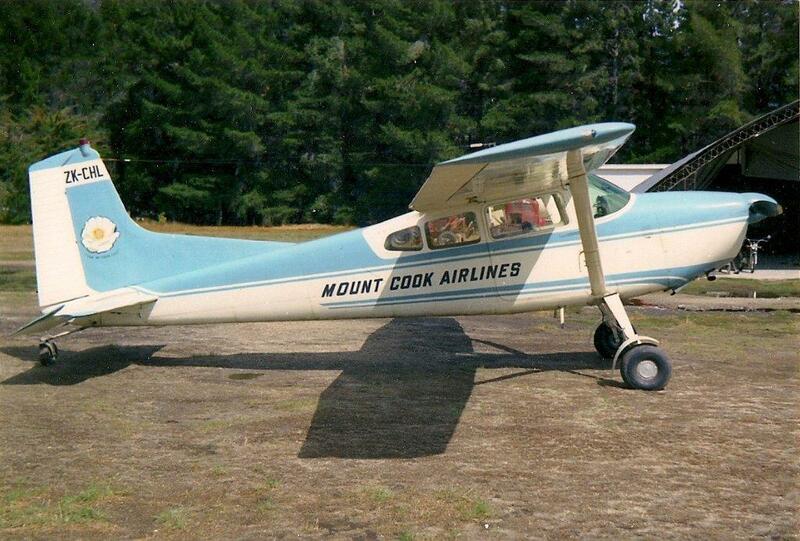 In late 1984, in the face of impending competition from Newmans Air the company was rebranded Mount Cook Airline. 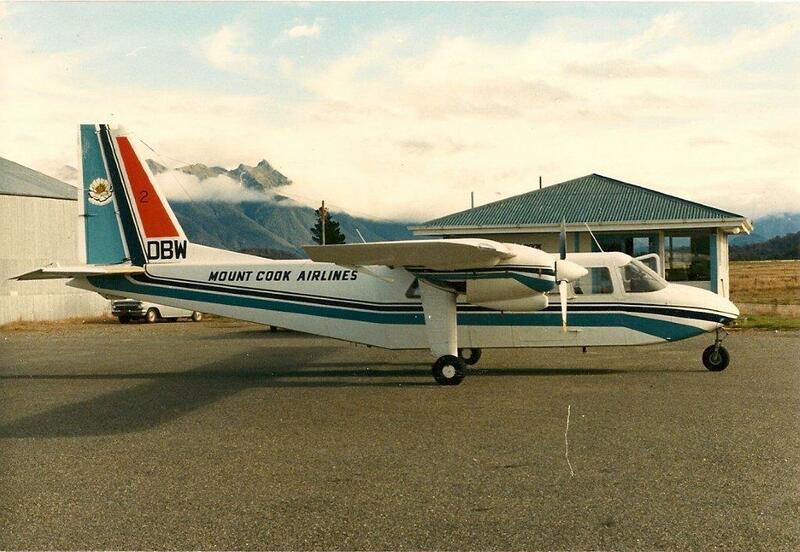 In November 1983 Mount Cook Airlines reintroduced a De Havilland Canada DHC-6 Twin Otter to its fleet. The company found the Hawker Siddeley 748s were too large for the Auckland-Bay of Islands and Auckland-Rotorua routes and that Britten Norman Islanders or Piper Chieftains were too small. An 18-seat Twin Otter, ZK-MCO, was purchased to provide a medium size aircraft for these runs. In June 1988 it was transferred to Queenstown for the Milford Sound flightseeing and the service to Te Anau. 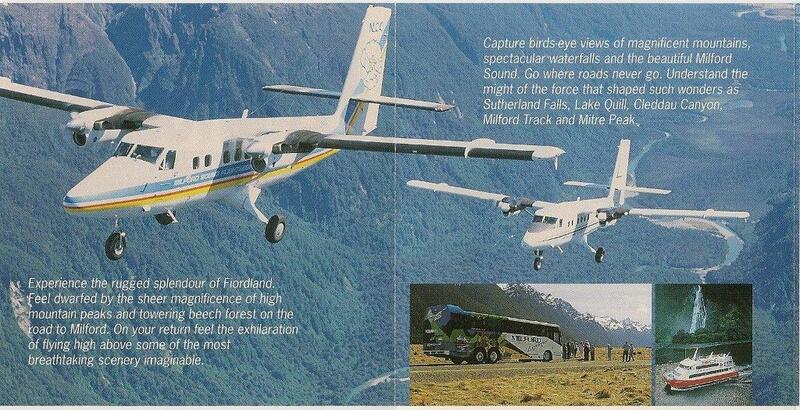 In 1990 an NDB was installed at Milford Sound and this allowed the Twin Otter to offer IFR flights. In January 1995 a second Twin Otter, ZK-TFS, was added to the fleet. Both served with the company until 1998. ZK-CHQ was one of two Cessna 206s operated by Mount Cook Airlines, the other being ZK-MCG. 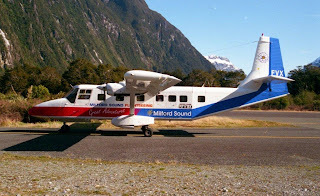 Both were normally used as floatplanes but here CHQ is seen in a late colour scheme with "Milford Sound Flightseeing titles being sported on the aircraft. Photo taken at Queenstown on 19 March 1989 by S Lowe. 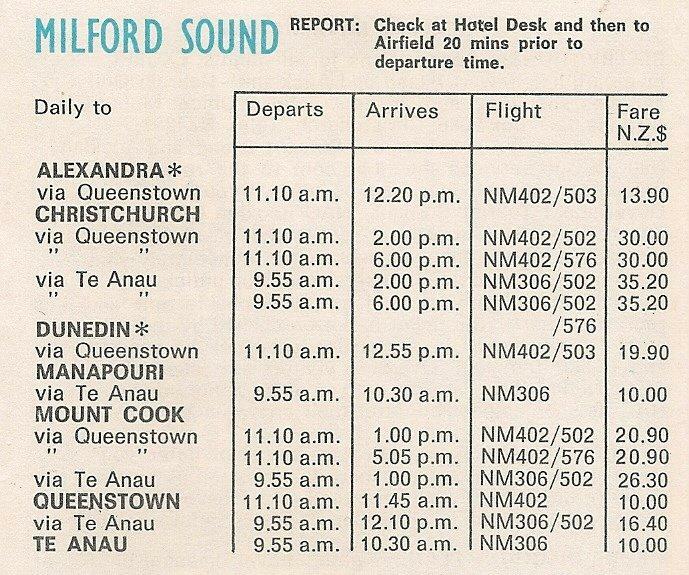 ﻿﻿Another change to the Milford Sound service came with Mount Cook Airline's purchase of Fiordland Travel on the 16th of July 1993. 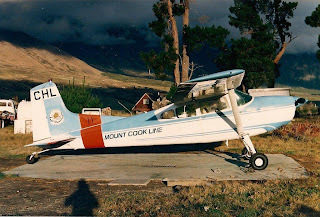 With this purchase two GAF Nomads were added to Mount Cook's fleet, a 12 seat N22 model, ZK-FVU, and a 15 seat N24 model, ZK-FVX. 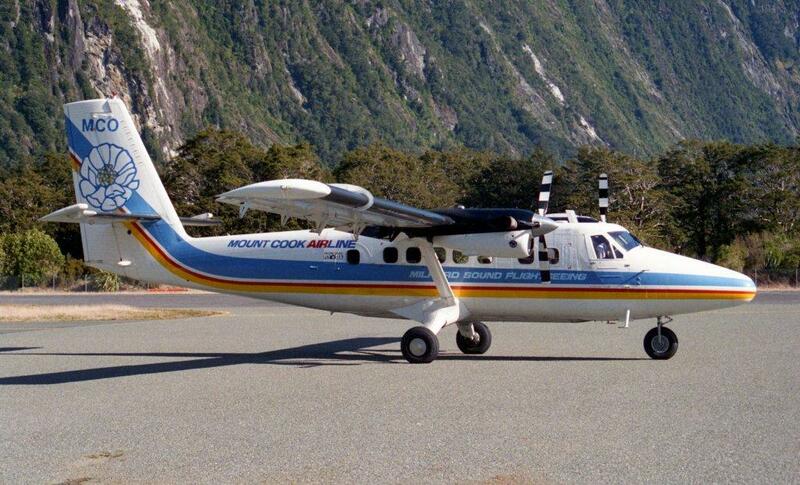 In October 1995 the first of Mount Cook Airline's new ATR 72 aircraft arrived in the country. These were branded as Air New Zealand Link reflecting Air New Zealand's total ownership of Mount Cook Airline. Increasingly the light aircraft operations didn't fit it in with the national carrier's mainline business. By late 1997, when I visited Milford Sound, the days of the Mount Cook lily being seen in Milford Sound were numbered. In mid-1998 Mount Cook Airlines’ light aircraft operations were sold ending Mount Cook Airline's service to Milford Sound. The Queenstown light aircraft division was sold to Tourism Holdings Ltd which traded as Milford Sound Flightseeing. It then became Tourism Flightseeing, a joint venture between The Helicopter Line and Real Journeys Limited. In September 2002 Real Journeys Ltd bought a 100% ownership and the operation was rebranded as Real Journeys. 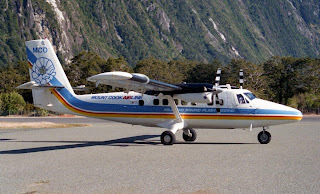 A further change of ownership was made in October 2009 when a 50/50 joint venture was formed with Totally Tourism Ltd, and the company renamed as Milford Sound Flights Limited.